As I already mentioned before, I have an non pressurized evacuated tube solar water heater on my roof. In that same post I outline the possibility to calculate the solar energy that will fall on a flat surface (panel) with arbitrary tilt and azimuth at any given day and time. The user AminfiBerlin immediately asked the natural question: Can you compare that against the actual yield? I my answer I replied I had some idea. Later that day, Trystan Lea of openenergymonitor.org posted his work on the exact same subject in this blog post. I tested it with an immersion heater on my other water tank and it is spot on..neat. Starting temperature is 40.62 degrees C and at the end of the day (at least the sunshine) it is 72.25 degrees C. It has been mostly sunny, apart for a thunderstorm with hail that is clearly visible by the drop of solar power, but then was all sunny again. 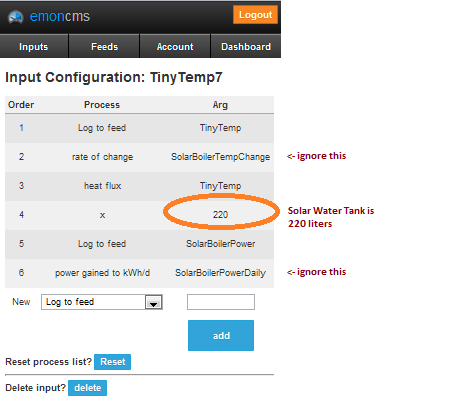 So for ten hours today, my 220l solar hot water heater managed to warm up water by 31.63 degrees C, or that would mean it managed to absorb 7.8KWh solar energy.